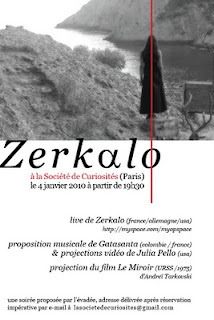 Very interesting looking live Zerkalo show about to take place in Paris on 4th Jan 2010. Details on flyer and on their MySpace. I wish I could be there but if you can you might as well go. The Tarkovsky film Mirror will also be shown. super live de Zerkalo, je me suis entretenu avec elle quelques minutes après le concert et j'ai été vraiment conquis par son projet et sa voix. Thanks for nice comments and info. Have updated last post with it.